Your Power is Out. Now What? There’s often a gap in thinking about backup and recovery. Hurricanes and snowstorms are often the go-to disasters. But a Hurricane Sandy-level storm comes along pretty rarely. The real threat is twofold. Outside threats are burst pipes, power outages, fires and flooded server rooms. When the office is inaccessible, how do you continue to conduct business? Ransomware, cyberattacks, malfunctioning equipment and bad actors are threats from inside. And these are extremely common. Disasters have a way of forcing businesses into a continuity drill. That’s why it’s essential for you take the steps beforehand to create a living, breathing document that teaches you and your team how to respond and carry on. With seamless, automatic and continuous replication to the cloud, you no longer have to worry about an unexpected outage or cyber-attack compromising your work. Continuity is about staying online. With a documented and tested business continuity plan, you’ve got the tools to keep your team in business in the face of a disaster. We work with your internal security management team to proactively address vulnerabilities. That way internet outages, hackers and natural disasters won’t stand a chance in disrupting your business. In the wake of an impactful event, do you have documented and rehearsed steps to resume operations? We invest our time in planning and testing your custom recovery plan, so you stay up-and-running with ease. When disaster strikes, our goal is to keep you online without you having to incur unexpected costs to rebuild your IT network. Let’s talk about how your business will avoid disasters. Call us today. 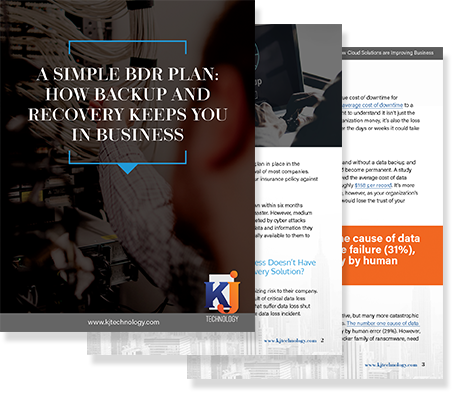 A comprehensive data backup and recovery plan protects your company from being on the losing end of natural disasters, hardware failures, human error and cyber-attacks.